FleetMode reduces the number of accidents/ crashes for your fleet. Learn how a major telecommunication company saw a 31% reduction in vehicular accidents. Fewer accidents means lower expenses. Save money on repairs, insurance, labor, and lawsuit liability: Discover your savings by visiting our ROI calculator. Fewer crashes equals less fatalities on our roads. With FleetMode, you are keeping your drivers and our roads safer. FleetMode changes your company’s driving culture. Automatic activation leaves your employees safe and secure to focus on what matters; safe driving!. Do you need some fleets to allow calls and others to block calls? You can customize this feature and many more. When Apple or Android releases a new update you can be sure FleetMode will always work. Including smartphones and tablets. Always know where your fleet has driven to, and where your company vehicle was last. No need to add expensive GPS tracking. Separate work from home, intelligent privacy allows FleetMode to only work in your work vehicle. Less work for managers. 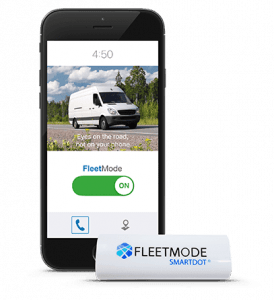 FleetMode provides electronic tools to empower your drivers towards safety. Give us a call or drop us a line at the information listed below. Stay up to speed with distracted driving prevention news. Ready to Start Saving Dollars and Lives?